BlinkText Addon is Messenger Plus! Live script that let your personal messages blink on Windows Live Messenger. Just enter your personal settings, activate the script and your personal message begins to blink. You can also set the blink duration of your text. 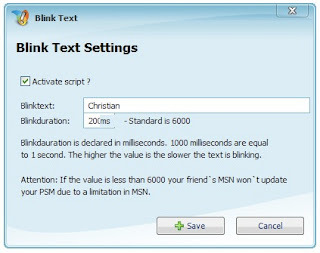 Due to a limitation in MSN the default value is set to 6000ms (6secs). In order to use this script you should have Messenger Plus! Live installed on your computer.